This weekend heralds our last open days for 2018 and there’s still lots to see. While asters and dahlias continue to bloom unabated, it’s the vivid colors of fall foliage and fruits that steal the show. 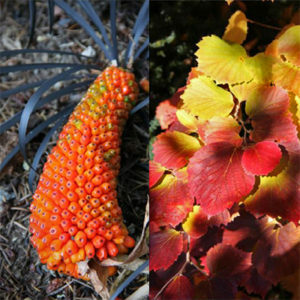 As the sun hovers low on the horizon, its rays shoot through our Woodland Garden, illuminating the golden leaves of spicebush (Lindera umbellata) and the rich reds of dwarf fothergilla (Fothergilla gardenii). Surrounding our parking lot, angelica-tree (Aralia elata) and Persian ironwood (Parrotia persica) are also colouring up, in a range of pink and reddish tones. Fall leaf colour results from the differing cocktail of pigments contained within the foliage. As temperatures cool, green pigments degrade revealing a mixture of other chemicals, mainly carotenoids and anthocyanins. Carotenoids get their name from carrots – they are the source of the orange colour – and fall leaves rich in carotenoids tend to be yellow. Anthocyanins are responsible for red and purple leaves, and also the color of strawberries and blueberries. It’s the proportions of these pigments that determines the color of fall leaves. Fruits also derive their colors from these pigments, but though fruits come in a bewildering array of colors, red and black are by far the most common. These two colors help to attract hungry animals, who feed on the fruits and disperse the seeds in their droppings. Here at Heronswood, our viburnums and hollies are starting to glow. 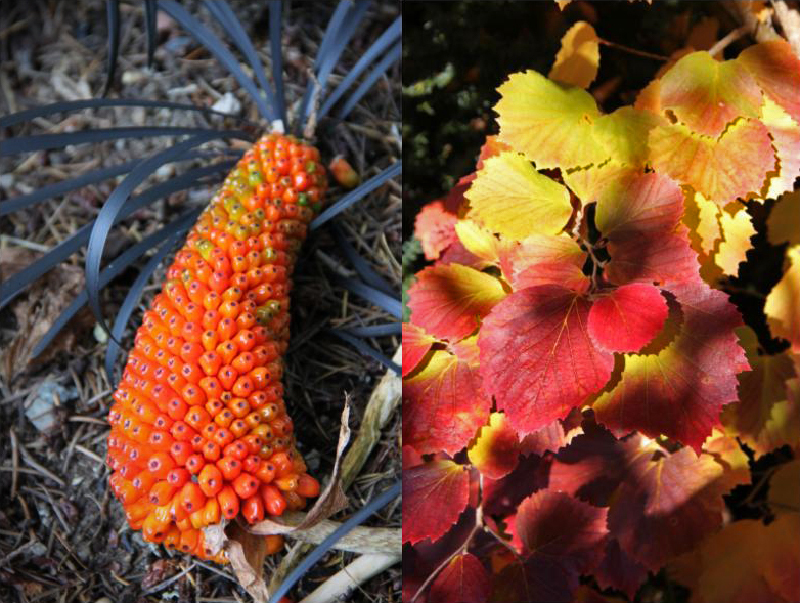 While colourful fruits are most often seen on trees and shrubs, many herbaceous arisaemas also put on a performance. They develop scaly clusters of fleshy fruits that appear strangely reptilian. With age, the clusters break apart, scattering the soil below with individual segments that resemble candy corn. And candy corn provides a handy segway to Halloween. With the spooky season almost upon us, I tried to think of the scariest plants at Heronswood. Alas, we can’t grow tropical orchids of the genus Dracula, nor bat plants (Tacca chantieri) or strangler figs. We do have Dead Man’s Fingers (Decaisnea insignis), whose blue, digit-like fruits are stuffed with gooey slime – find them on the south side of the Potager. Our pumpkin patch has also provided a tip top harvest – join us on the 20th and you can carve your own for $5. While this weekend is our last open garden, come visit on 26-27th (from 5-9 pm) for Haunted Heronswood. Explore the garden under cover of darkness, but beware that carnivorous plants may be lurking!